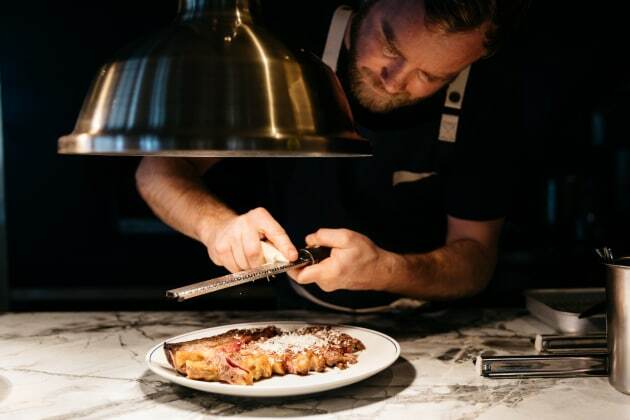 All-day bistro, The Pacific Club Bondi Beach, has kicked open its doors as head chef Bret Cameron looks to shake up Bondi's culinary landscape with a celebration of local, wild and native produce. With space for 100 diners, including 40 seats outside, The Pacific Club Bondi Beach is located the ground floor of the Pacific building looking out over Campbell Parade and the beach. From breakfast to lunch to dinner, the new venue sees a seamless love affair with Australian produce and ingredients. Indeed, The Pacific Club Bondi Beach's mantra reflects Cameron's, who leads the team after a long stint at Harvest Newrybar. “For me, cooking on an open flame makes me feel more in touch with nature," says Cameron. Accordingly, the open kitchen features a customised wood fire grill as well as raw bar, from which such seafood highlights include Ballina prawns and Sydney rock oysters. Looking after the drinks program are former Good Food Guide's Sommelier of the Year, Chris Morrison, and Michael Chiem of PS40 and 2016 Australian Bartender of the Year. The Pacific Club Bondi Beach's wine list is an acclectic collection of labels designed to reflect Bondi Beach's diverse comunity and visitors. As such, there's a strong focus on Australian wine, as well as a wide of range international varieties haiing from over 12 different countries. And to complement Cameron's menu, Chiem has crafted a cocktail list that heavily draws on Australian native ingredients. “Bondi is free-flowing, light, colourful, playful and also well versed in exploring different tastes," he says, "our cocktail list captures the effervescent spirit of Bondi." For further information, please visit thepacificclub.com.au.